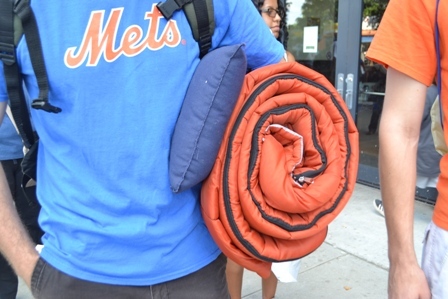 brandflakesforbreakfast: ever wanted to sleep on a MLB field? The Mets have you covered! ever wanted to sleep on a MLB field? The Mets have you covered! This weekend, the New York Mets hosted a very different stadium promotion. Tickets to the first ever "Citi Field Sleepover" included a dinner buffet, tickets to a future game, broadcast of the night’s away game, and even a children’s movie on the big screen in center field! If popular, this unique marketing ploy could be a great way for teams to turn a profit even while on the road.